The Vol. 4, No. 5 issue of The Pride highlights the new Closed Circuit TV system on campus. In other news, acclaimed author Rudolf Anaya is set to speak and do a book signing at CSUSM. 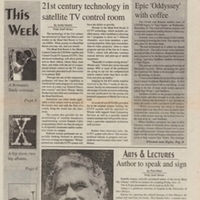 November 13, 1996,” University Archives at the CSUSM Library, accessed April 20, 2019, https://archives.csusm.edu/student-newspapers/record/117.